Collection of modern beds and creative bed designs from all over the world. 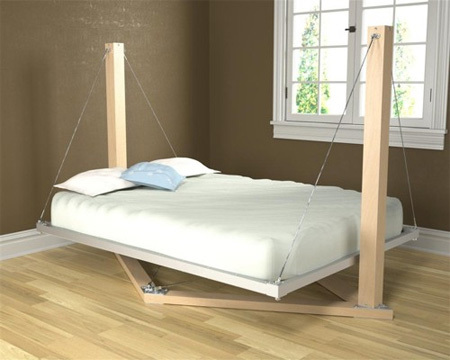 Creative suspended bed held by machined aluminum, stainless steel tension cables. 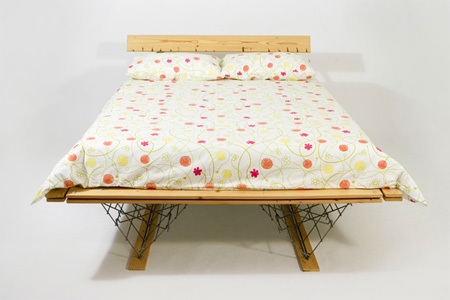 The mattress platform is held completely rigid – it does not swing or sway. $25,000 Float Bed by David Trubridge, a New Zealand designer. 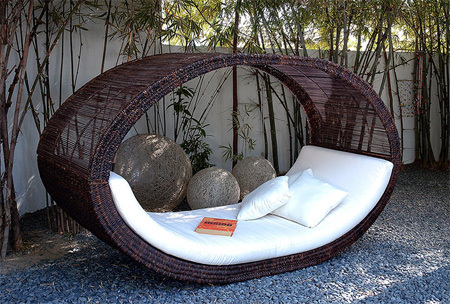 Amazing outdoor bed design from Lifeshop Collection. 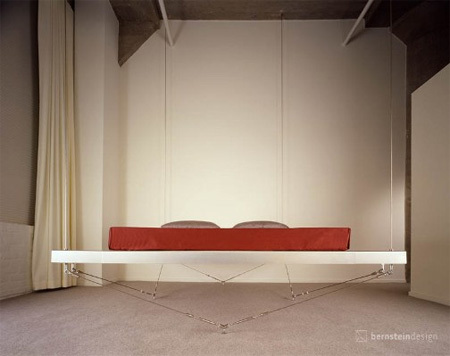 Floating Bed Chicago by Robert Bernstein – the four supporting cables at the corners of the bed go straight up vertically to the ceiling. 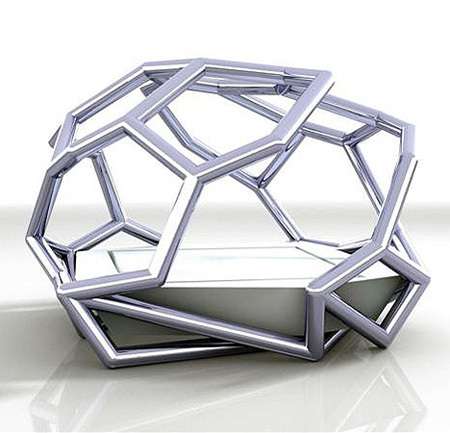 Ness faceted geometric bed by Jakob+MacFarlane. Creative lounge by Lost Angeles based designer Tanya Aguiñiga. 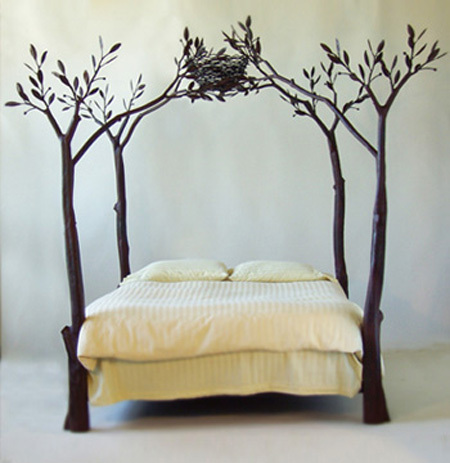 Creative $15,000 Tree bed by Shawn Lovell. 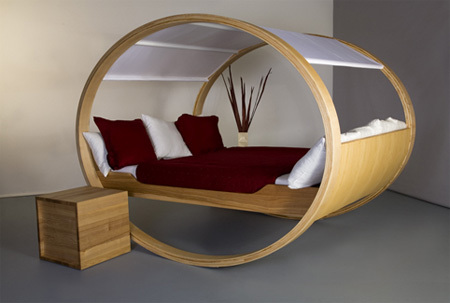 The Private Cloud is a patented rocking bed by German designer Manuel Kloker. Creative bed design. Pull out side tables with cup holders can be ordered for one or both sides of the bed. 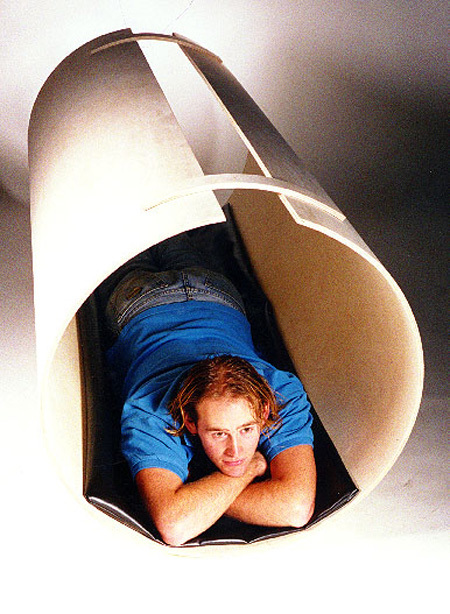 Futuristic two metre “sleeping tube”. 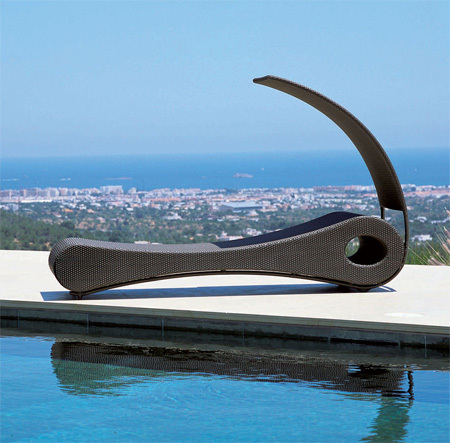 This elegant piece by Rausch, designed for luxurious poolside lounging, could easily be mistaken for a dramatic outdoor sculpture. It is elegant, fluid, and harmonic, starting from a lucid plastic body, floating on a metallic frame, and varnished with the same colour but with a matt finishing. Its shape invites and supports its double function as an arm-chair and chaise longue. 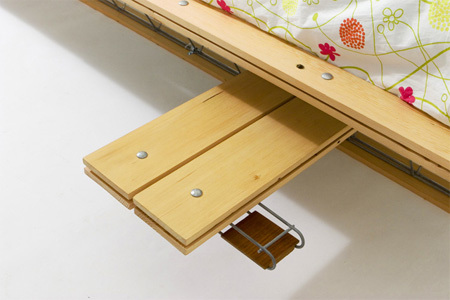 Conventional furniture is in contact with the earth through gravity. Floating Bed overcomes this fundamental power and falls towards the sky. Four thin cables assure its motionless position and form the only contact with the ground. Scoop! 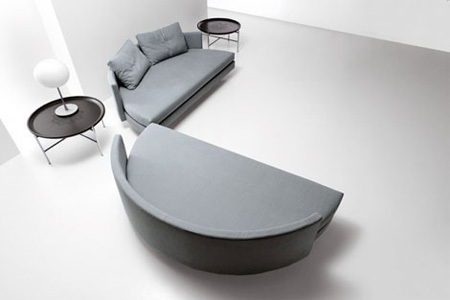 is a sophisticated and innovative answer to the demand for combinig the sofa function with the bed function. 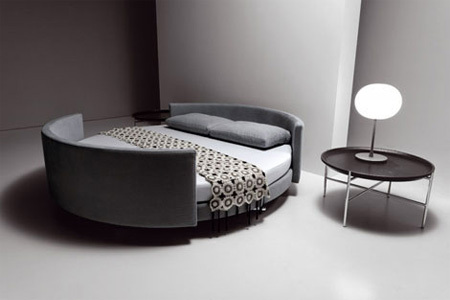 The two semi-circular sides of the bed can be separated resulting in two new pieces of furniture. 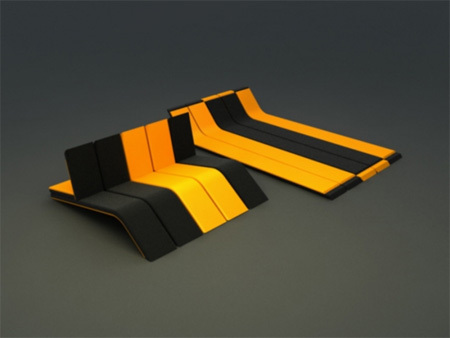 Innovative bed design that may prove handy for poor homeless people worldwide. 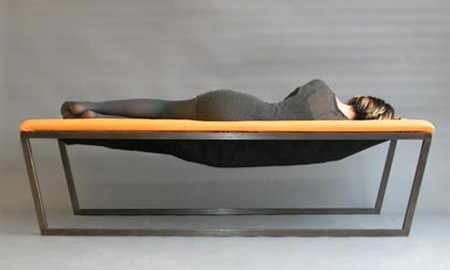 Ohm is a bed that can be transformed into two individual beds or used as a bench. That is just to cool. Wow! I like the Scoop Bed. 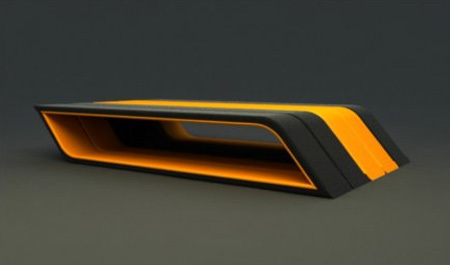 The magnetic floating one has an awesome concept. staring at those design, we’ll make you say what in the world is goin on! The magnetic bed isn’t a concept. I think that the last figure I saw for it was $5000. Nice collection of designer beds. 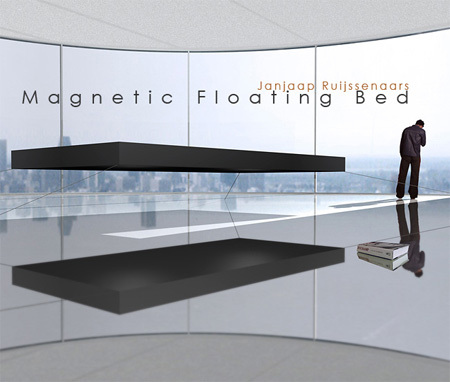 Wow awesome Magnetic floating bed i love that!! give thumb up on SU!! the scoop bed and sleeping tube are spacing saving beds, too good. Creative sleep devices…I absolutely want a “House fish bed”. The Housefish suspended bed is a great idea. Here’s why. My wife has Rheumatoid Arthritis and getting into and out of most beds is difficult. Most beds are too low and place strain on her knees and hips. This bed could be adjusted for height with the addition of turnbuckles in the cables. Her bed height requirements change depending on level of RA activity. If an electric motor could be incorporated it would be a great boon. I have converted and car power seat for indoor use. Why don’t we have those in regular furniture? You know the remote unlock for your car door, why not on our house door? really cool beds. Are the comfortable? I like the cool look, and the style is Awsome! good for people who have back pain and have trouble getting all the way down on a flat bed. great design of bed, I wonder where you get that pics ? Really really cool Beds… Are they comfortable? They all sure look it! Its such a pleasure to look at beauty…always. i loved the tree bed! & dude this is amazing! Very cool but most of them don’t look very comfortable. Nice beds, but What homeless person is going to be able to get enough money for the cardboard bed? I mean these are “designer” beds. I’m sure if they had money, the last thing they will buy with it is a cardboard bed.What ha[[ens the first time it really pours rain, ever seen wet cardboard and how unstable it becomes? Nice job on the pictures!! Where do I get any of these beds in Atlantic Canada or Saint John, New Brunswick???? thank you stumble upon! this is amazing!! REALLY AMAZING DESIGNS! HATS OFF TO THE MOULDERS! cool pics.like to sleep on it. Cool designs. I like bed furnitures .. .
some were cool, some were a bit weak. nice stumble! 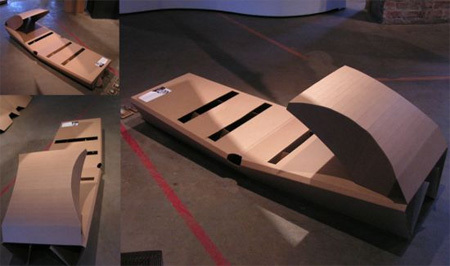 The Cardboard Bed is a MUST for those poor people whom are homeless. They would require a waterproof coating , and could be dispensed each night from a Central Depot . Government funding essential. A humane and kind idea . 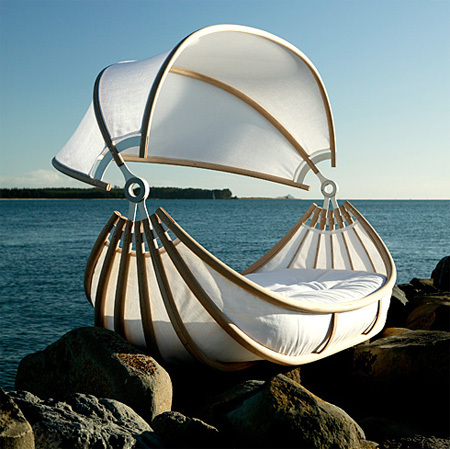 My favorite is the Cloud Rocker Bed! This could be very soothing. Great Stumble! Mac….that would only matter if this were a French/English translation lesson or a spelling test. Otherwise, it’s really just to appreciate design. I love the tree bed…beautiful ! Great ideas… Some better for camping than others. noooo, i want all of them! the disposable cardboard bed cracks me up! i want a magnet bed!!!!!!!!! BEAUTIFULLLLLLL beds!! so now how can one get his hands on them? Actually very creative. However, some are not designed for an imbiber. Too dangerous. I wanted to compliment the private rocking bed. That would be fun! The cardboard and olm were also favs too. Thumbs Up on SU! The Chicago Floating Bed is awesome! Inspirational designs! It’s amazing how we can continue to reinvent things that have been used for centuries. I like the geometric one. 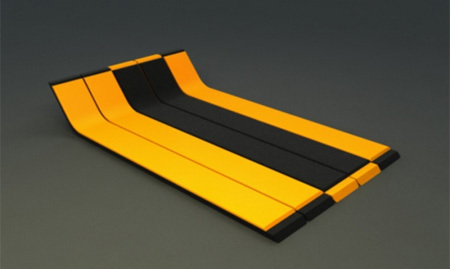 Would be neat if you could get that as a frame from a car. I love the creativity of the beds, but I think I would be too freaked out to sleep in any of them. wow.. i cant decide which one i like the best! Where can we buy those beds? This is modern world, people are being creative. They aren’t for ordinary people but for the affordable who living with technology thats required changes at all times. I bought Scoop bed are let mi tell you this amazing. comfiest ever bed. 感謝你為這個驚人的床。我很自豪能夠成為一張床主人. Love the magnetic floating bed. Freight would be cheap too since it would be lightening the load by lifting against the roof of the truck. These are fantastic, very creative & stylish! 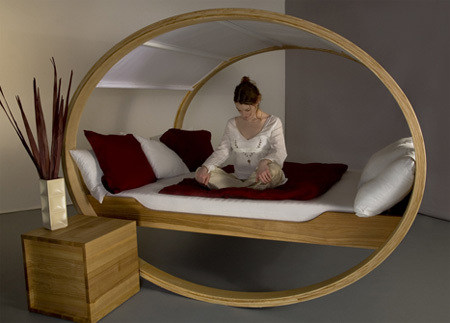 The Private Cloud Rocking Bed is a gift for meditation. O.K the sleeping tube is just stupid. It’s like using a sleeping bag, but it takes up more space. I like the magnetic bed, though. Really good ideas.Personally I like the private cloud rocking bed-mind you just the design and not the concept. The design is good. If you have a medium size room-like a guest room then all you need is this bed and perhaps a chair or two and your room wouldn’t look sparsely done but would charm one and all. Almost all the designs are good except perhaps for the cardboard one which i feel is not a practical solution. Good concept, just not practical! I love the float bed. Wish I cud hava bed like one of them!!! i like the rocking bed!!!!!!!! I like tree bad & sunset bad in all this !! No-doubt they are unique, but how I can get one? I really appreciate simple,modern design. I just love how people come up with things from nature.The Tree bed by Shawn Lovell is beautiful!!! A great deal of creativity went into these designs. Simply amazing! Beautiful. The tree bed and the private rocking bed are glorious. These are some of the coolest designs I’ve ever seen. Can you ship to the Caribbean, or are there Caribbean-based suppliers/distributors? The scoop bed is a perfect solution for a studio apartment or a small cottage. Thanks for this post. reallyyyyyyy creative and cool designs. OMG! I want that floating magnet bed!!! they are nice beds but i do want try make them. WOW!! i LOVE the tree one! its amazing i would make me feel like im outside!! Embrace lounge, float bed and the Magnetic one are superb. Very creative designs. Is it just me or did others find the ‘homeless’ bed write up inappropriate and condescending?